- your SO is boss of your squad (holder of the blue timer). - YOU should also be safety conscious, shout "STOP" if anything looks unsafe. * ALWAYS keep the muzzle pointed in a safe direction. (no more than 90 deg from the forward berm)... verbal cue for infractions is "Muzzle!" * ALWAYS keep you finger off the trigger until ready to fire. (finger ON frame unless pulling the trigger)... verbal cue for infractions is "Finger!" * ALWAYS keep the gun unloaded till ready to **use. - The range is going HOT! Eyes and ears! - Shooter LOAD and make ready. - Any questions? ...Stand by! shooter will run the course as directed, then stop and wait for SO directions. - you MAY load mags anywhere & stow them on your body. - guns NEVER leave holsters, slings, or case except at "gun-handling" bench, and NO LIVE AMMO at this bench. - EVERYONE can help, no exceptions, if you can shoot then there is a job for you. (scoring, pasting, brass-picking, target reset, set-up & tear-down). 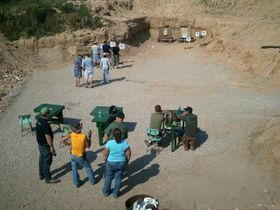 - Expect to meet shooters of varying skill levels, from newbs to experts. Be willing to teach when necessary and always be willing to learn (we DON'T know what we don't know). - visually review the course before each shooter (SO's can't see everything), shout if you see a hole to paste or a target not reset. - pay attention to your squad roster, have your gear READY when it's your turn. * STOP all action, in all squads, till the situation is assessed & under control. * call the designated FIRST AID tech to the scene. * acquire the FIRST AID kit, needed or not. * if necessary the designated 911 caller contacts dispatch: "a training accident...". * if an ambulance is called, the designated runner will meet them at the gate. * an SO will safely remove any loaded firearm from the scene & render it safe. * stay back & let folks work. 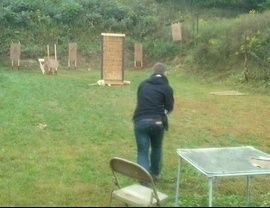 Zombie Culls give us a chance to play IDPA style games without all the limitations imposed by the national standards. Here at the culls we simply "run what ya brung". The range itself has some limits, like no .50 BMG, no full-auto or bump-fire guns, but otherwise, run it! Got big magazines with huge capacity? Bring it! Got tricked-out race-guns or seven pounds of tactical gear on your AR platform? Bring it! We expect folks to wear eye & ear protection, but apart from that it's your call (subject of course to any safety concerns, your SO is boss). Wanna dress like a zombie? Gear-up like an operator? Show up in your duty belt or SWAT rig? Bring it!